Hello, I’m new to the site and the forum so please direct me if I placed this question in the wrong forum. I received the vise in an auction. I can’t figure out how the vise is supposed to be mounted. I didn’t see a maker anywhere on the vise either. Could it be I’m missing another plate to mount it to the bench? The Stanley part came in a box lot of Stanley combination planes. 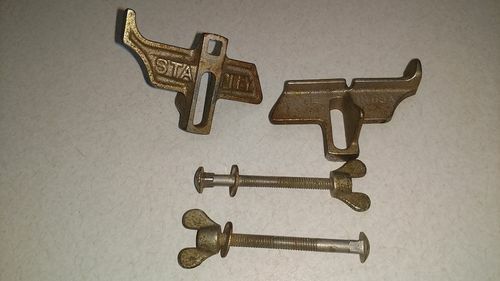 In the box was a No.50, a No.45,various loose cutters and 4 full boxes of cutters for a Stanley 55. I’ve looked through the drawing for the combo planes and don’t see anything that looks like this part. Does anyone have any ideas of what this might be? Thank you! That part is an auger bit depth gauge, I think a #59. I have one, very useful. 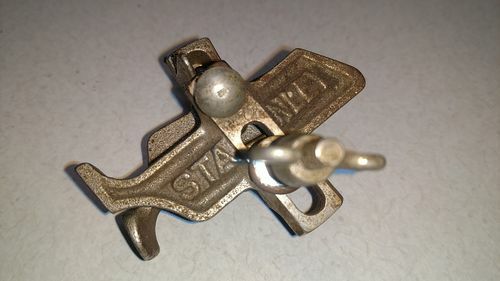 It looks to me as if the vise would mount to the underside of a work bench, with the L-bracket cupping the lower corner. Holes would have to be augered out in order to provide ways/reliefs for the the screw and guide rods. 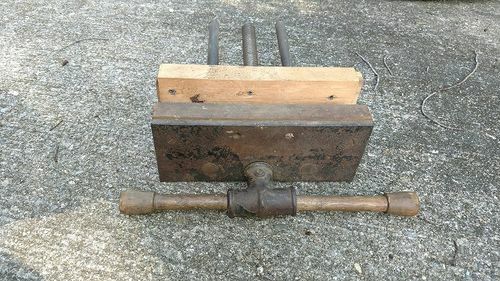 This particular vise looks like a hybrid between the modern steel jaw vise and the classic wood jaw vise. Honestly, it looks homemade, especially since you said you cant find a maker. I hope you did not pay an arm and a leg for it. Thanks Smitty! Much appreciated. I thought it was a depth stop of some kind. @ MikeGV- You might be right about it being cobbled together. The front is definitely a factory face and the guide rods have good welds to the face. The back half is another story. There’s no holes to mount it to anything but it had recent wood mounted in it so someone was using it. It could have been a setup someone made for a particular use?? It was actually a bonus to the auction. 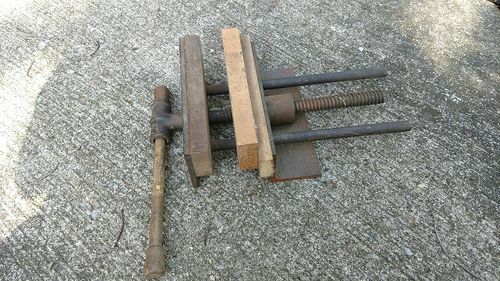 I bought a craftsman planer and this vise along with another nice wood working vise, a saw vise, and 3 stock supports and some miscellaneous tools. I didn’t do bad for $50. Stopher, I’m wondering if then back part of that vise (the angle iron) can be flipped over? 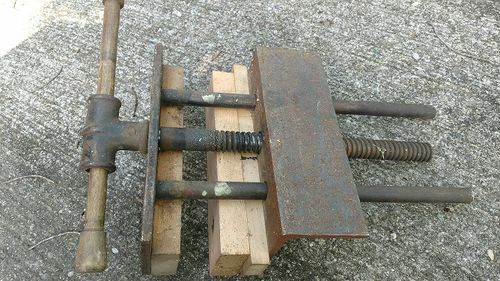 That way, with holes drilled in the angle iron, it could be attached to the underside of the bench and with the addition of a couple wood chops, be made to work as an effective vise? I think Smitty is right, you can probably turn that into a pretty nice vise. And you’re right, that’s not too bad of a haul for $50! I can see how that would be mounted if you flip the back part over like Smitty says, but it doesn’t look like there’s any holes in it so I don’t see how it was mounted. 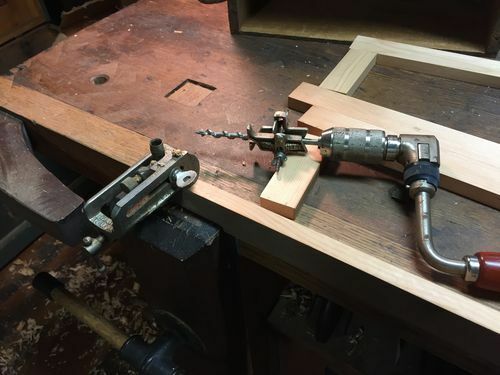 Maybe it was meant to be a mobile bench top vise and was clamped in place. Either way the back jaw doesn’t look like it’s going to be very tall, the wood back face sticks up over it as it is. Bit depth gauge looks awesome, I’ve been looking for one of those and sounds like a good score on the combination planes and cutters. Yeah I think you guys are correct. I think I’ll flip it over and drill holes. Lack of holes is what was throwing me off to begin with. Its always nice to get a second (or third) set of eyes on something. I appreciate you guys helping me out. I was starting to think I was missing something simple with the vise.